The Third International TWIN-SEA Workshop co-organized by UNU-EHS and the Indonesian Institute of Sciences (LIPI) brought together around 50 participants from academia and research institutions, Indonesian line ministries, the Indonesian government, German and Indonesian private sectors, international organizations and non-government organizations. 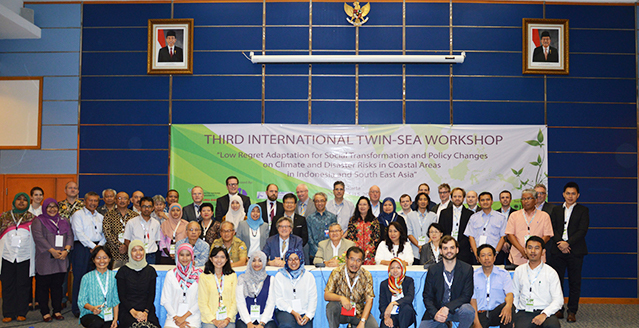 The workshop was part of the TWIN-SEA network project which aims at developing low-regret adaptation solutions for coastal areas in Indonesia and Southeast Asia at risk from natural hazards and climate change impacts. The annual network meeting provides a platform to present and discuss research findings and practical adaptation solutions developed and tested by TWIN-SEA network partners. Four keynote speakers were invited to deliver perspectives from the Government of Jakarta and from the frontline of current scientific debates around risk and resilience in Indonesia and Germany. The Government of Jakarta addressed policy questions on improving science-based decision making and identifying and overcoming the impacts disasters and climate change have on development. In addition, the government called for comprehensive scientific support to be provided to officials and lawmakers in order to better understand climate change impacts and identify how measures of disaster risk reduction and climate change adaptation can be mainstreamed and implemented in development plans. With the presence of German and Indonesian private sector entrepreneurs on workshop panels, important insights were gained on the role and capacity of the private sector in tackling the challenges of coastal adaptation. Especially the synergies between grey and green infrastructure for coastal protection were discussed, in view of their policy and business implications. Other examples of linking science and the private sector were also discussed, such as the use of modeling to calculate risk in insurance industries. Further discussion revolved around how private sector engagement is increasingly critical, especially because of its influence on the economy. It is also in the private sectors best interest to address challenges from natural hazard as businesses are not immune to risk exposures and disaster impacts. Research findings show, for instance, that proactive measures to combat flooding at firm level are widely lacking in Jakarta and in other parts of Indonesia. Approaches to risk reduction therefore need to better account for individual and collective mitigation and adaptation measures at the firm level. Understanding private sector behavior and adaptation is pivotal. On the final day of the workshop participants went on a field trip to North Jakarta, where they visited Mutiara beach to observe the large scale reclamation of a coastal area. They also visited the Pluit dam and went to the office of Ground Water Conservation (Ministry of Energy and Mineral Resources) to observe land subsidence in Jakarta. A visit to Sluice gate in Mangga dua was undertaken to observe how water volume and water discharge to the sea was controlled. Finally, participants visited the LIPI Research Center for Oceanography as well as Tanjung Priok, a massive sea port development to be finished in 2023 with Phase 1 planned to finish in 2017, that was built in response to the President’s plan to build an Indonesian sea toll. Looking ahead, the workshop participants identified emerging research needs for the next years and ideas on how to address them from within the TWIN-SEA network. Moreover, next year’s strategy for science-policy-dialogue and outreach material was developed. Additional platforms for strengthening the collaboration between Indonesian and German partner institutions have been discussed, most importantly, a planned joint research school between UNU-EHS and LIPI. The next TWIN-SEA workshop is planned for early 2017. More information on the TWIN-SEA network project is available here.